A trip on the entire length of the Reunification Express from Hanoi to Ho Chi Minh City has long been high on my bucket list for many years. Surprising really, considering that I used to moan like hell about my daily commute in and out of London which took 4 hours a day for more years than I care to remember! Running between Hanoi and Saigon and covering a staggering 1,726 km, this is one of Asia’s iconic rail trips. The entire route takes some 36 hours so rather than do it all in one go, we decided to carve the route up into bite sized chunks. Planning the route was pretty straightforward using the incredibly helpful http://seat61.com . Purchasing tickets was also pretty straightforward. We simply asked our hotels to do it for us ( fo a small commission) or bought tickets at the train stations a couple of days in advance. Hard sleeper – 6 bunks to a compartment. Snug is the word. Six bunks may be ok for Vietnamese sized people but most westerners would be much more comfortable in soft sleepers. Regardless of hard or soft the bunks are equally hard! Soft Sleeper – Only 4 bunks and it makes a big difference. Best option is to choose the bottom two bunks which are only a little more expensive. The top bunks are basically the same but require the agility of a Cirque de Soleil performer to get in and out. We managed to secure a soft sleeper and the bottom bunks. Hard and soft seats – are only really suitable for shorter trips both have air conditioning but hard seats are also available with no aircon. There is a restaurant car of sorts available but when I visited all the train staff were using it for R & R – I bought a couple of beers and left. An hour or so later the staff came around to take orders and deliver food in polystyrene boxes. None of it ever looks too appetising. Fortunately we go prepared, armed with snacks, boiled eggs, fruit , Ritz crackers and Laughing Cow processed cheese. Not exactly Masterchef standards but it does the trick. We after we checked out of our hotel room we waited around in the hotel dining room for a few hours until until we got a taxi to Hanoi station for our train departing at 20.10. The rats that we had heard scuttling around in the ceiling space in our bedroom for the last six days were clearly sad to see us go as they came down into the dining room and kitchen area of the hotel to see us off. We probably saw about 10 in the space of the 3 hours we were waiting around! A German woman came into the dining room and asked where is the toilet. I pointed to it but said that she may want to try elsewhere as there was a big rat in there. It took a few seconds for the translation to kick in and then she shot out of there like a moto driver at the end of his shift! Finding and boarding our train was very easy. We just waited for them to turn the lights on, found our compartment settled in and just as we were counting our blessings that we had a compartment to ourselves, minutes before departure, we were joined by two young Vietnamese guys. One fell immediately asleep and was virtually comatose for the entire journey. The other played games or talked on his phone until “lights out” at 10.00pm. 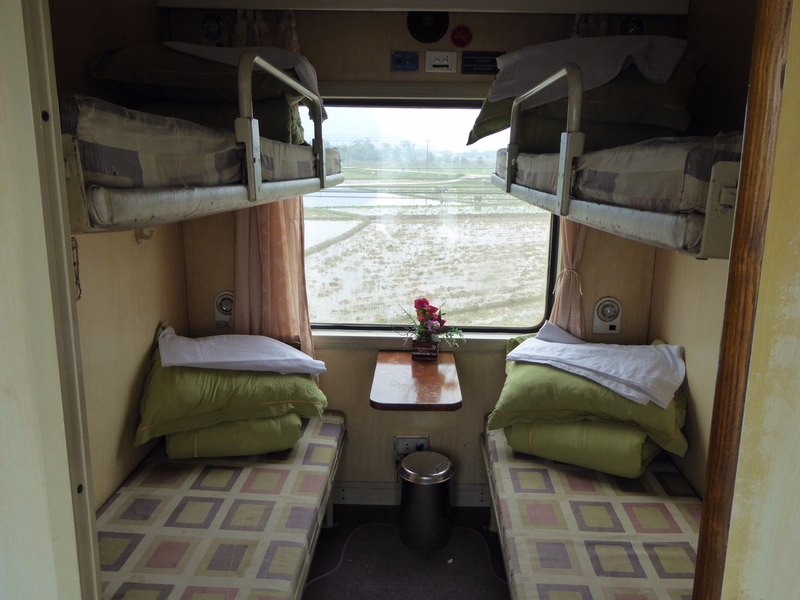 Sleeper trains are great in theory, saving both time and accommodation costs, but the reality is that we got little, if any sleep. Vietnamese trains are old, rattle and shake a lot and have no suspension to speak of. Add to this, the rock hard mattress and the fact that our compartment was right at the end of the carriage next to the toilets the traffic past our door was considerable. Adding to our discomfort, people congregate at the end of the carriage to smoke and our air-con drew all this lovely smoke into our carriage! Looking on the bright side, we were right next to the public address speaker, so at least we got the pleasure of listening to opera at full blast at 5.00am – not that we needed an alarm! Food is available on the train from the train guards who seem to run a sideline “at seat delivery service. It didn’t look, and never has looked, very appetising so we were glad we had the foresight to bring supplies. 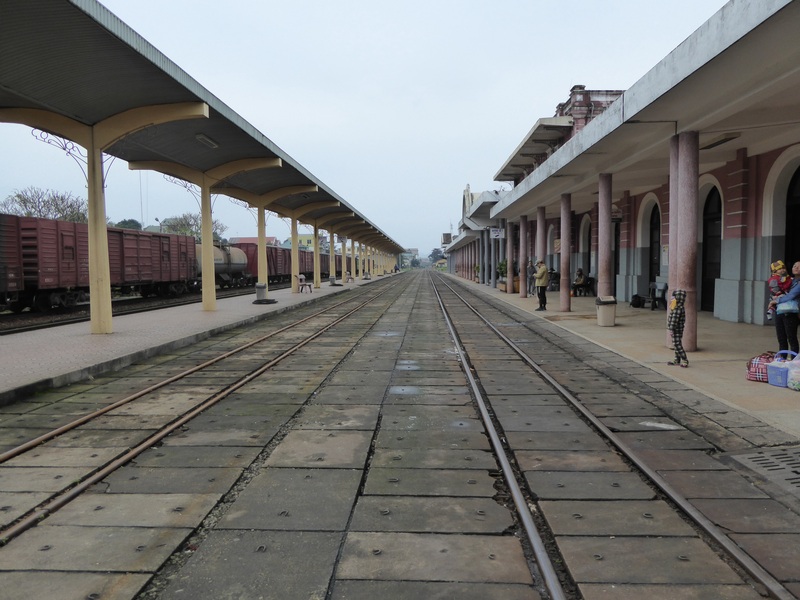 Arriving almost exactly on time in Hue at 09.40 was an amazing feat given the state of Vietnam’s railways. If only my daily commute into London on Richard Branson’s Virgin Trains had been so punctual!!! However, with virtually no sleep, we both felt more jet- lagged than if we had been on an inter-continental flight. Our time in Hue is covered in a separate post. The last time we came to Vietnam we did this trip in the reverse direction. It is one of the most scenic train rides in Asia Travelling along the coast, the track winds its way along China Beach and through tunnels in the Marble mountains before arriving in the now thriving city of Da Nang. Sadly, the weather was dull and overcast which detracted from the views somewhat. Da Nang was quite a surprise. It is quite a few years since we last visited and the place has grown out of all recognition. We drove through the city from the rail station to our hotel right on China Beach. Crossing one of the bridges over the river we got great views of the famed “Dragon Bridge” – shaped like a very long dragon it makes quiet a sight when lit up at night, especially on a Friday when it actually breathes fire from the dragon’s head. Last week, in an Indian restaurant, Carolyn recognised a woman from her photograph in a blog she had been reading that day. They got talking and we agreed to meet up in Da Nang as we were all there at the same time. Shannon and Brian are from New York and, like us have been travelling for a number of years. We met up at our hotel jumped into a cab and headed to a BBQ joint in the city. Not a great meal it has to be said but we more than made up for that with the amount of beer consumed, at the restaurant, at a bar in the city and finally back at our hotel bar. It was great to swap stories and tips with fellow travellers. Da Nang would be much better visited during the dry season which was yet to reach central Vietnam. When we were there it was wet dry and cold ( just like home!) . That said, I can understand why people do visit the beach is very wide, long and has great surf. The downside being that the whole of China beach appears to be a gigantic building site at the moment with new hotels being half built everywhere. Not entirely sure the Vietnamese are getting their development priorities absolutely right yet..
China beach Da Nang. Sadly, not our hotel! 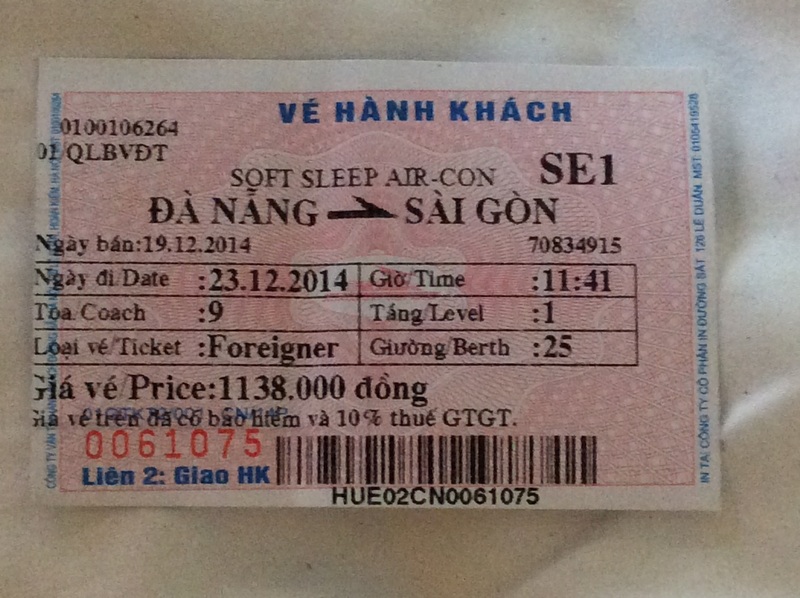 We had left buying our tickets from Da Nang to the last minute of our time in Hue and only just managed to secure the last two lower berth soft sleepers available. The bad news was that they were on the earlier train. This meant we would depart at 11.26 am. The bad news was that we would arrive in Saigon at 4.3o am the next day. Way before our our next home-stay in the city would be open..
Boarding the train we realised that we had gotten the same berths as before – next to the toilets! Worse still we had a “Goldilocks” moment. There was someone in our bed! A Vietnamese guy had set up camp there. A few words and a lot of sign language we persuaded him that they were our berths and he moved on to squat in a cabin along the carriage, periodically returning to check his phone which he had left on charge – so much for all the warnings about leaving stuff unattended on Vietnamese trains! Not anxious to jump straight into someone else’s sweaty pit, we tried to find the guard to get him to change the bedding. He was nowhere to be seen so we just removed some (possibly unused!) bedding from another carriage and change the sheets. Our first companion finally retrieved his bag and phone got off at one of the stations along the way and was replaced by a nice Vietnamese couple who had the same issue as us in having to make their own beds from the existing bedding left behind. A more difficult task as theirs were the top bunks. Incredible to watch as the woman leaped nimbly from one top bunk to another on the moving and swaying train. We all chatted for a while, swapping the usual “where are you from, where are you going information, until lights out. Again, very little sleep. Really beginning to envy the Vietnamese people who seemingly can sleep anywhere!! Reaching the outskirts of Ho Chi Minh City, it took a further 90 mins before we got to the station in Saigon at 4.30 am. On time yet again! It was still dark but the city was beginning to wake up, just as we were about ready to fall asleep. Of course none of the restaurants in the station were open for breakfast so, to kill time and to eat, we walked into the streets outside and found a Pho stall that was open. We had a terrific bowl of Pho Bo ( beef soup) complete with beansprouts, noodle, oodles of fresh herbs and a liberal dose of chilli. The rejuvenation properties of Phó are amazing and we felt better immediately. A great way to finally tick off one of our bucket list items. Cool that you ran into the Everywhere Once guys! I had better luck than you on the Reunification Express and actually slept. 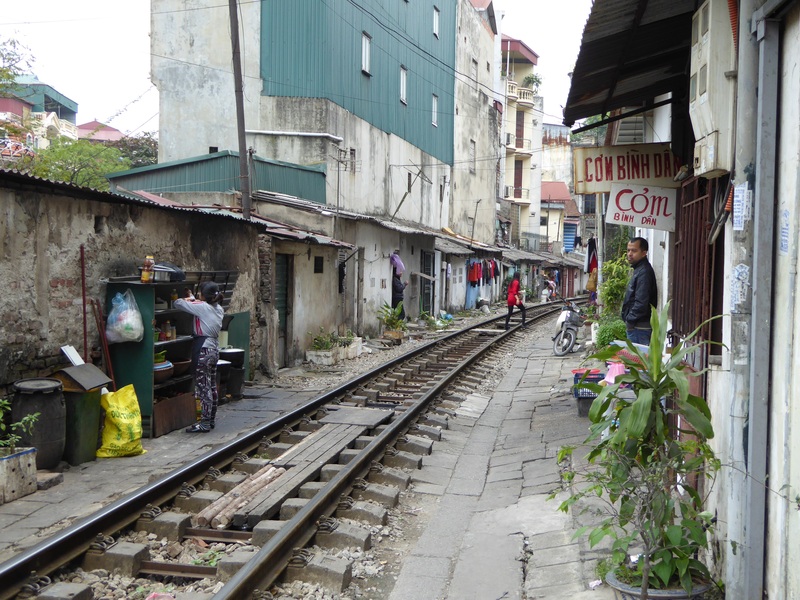 The really bad experience was the train to/from Sapa – felt and sounded like they hadn’t coupled the carriages correctly. If I’m doing night trains I travel with a silk Dreamsack, just in case. Weighs next to nothing and takes little room. We bumped into Everywhere Once guys a bit and look forward to again in Bangkok. Good tip about the silk sac! It is about time we ran into you thursdaysd! I am surprised it hasn’t happened already as we have been to a lot of the same places. That would be fun, but it will be Europe again this year. My niece is getting married in Reading end of August, I’m thinking of Scandinavia beforehand.